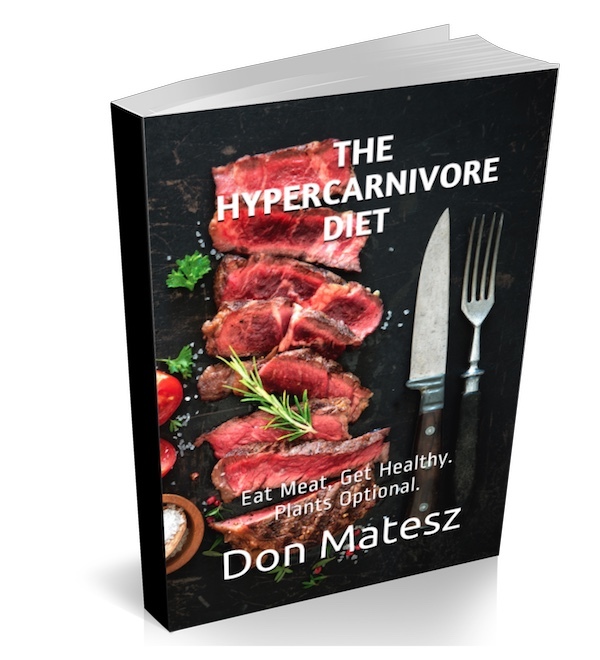 The HyperCarnivore: The Hypercarnivore: Eat Meat, Plants Optional, Keep It Simple And BE FREE! 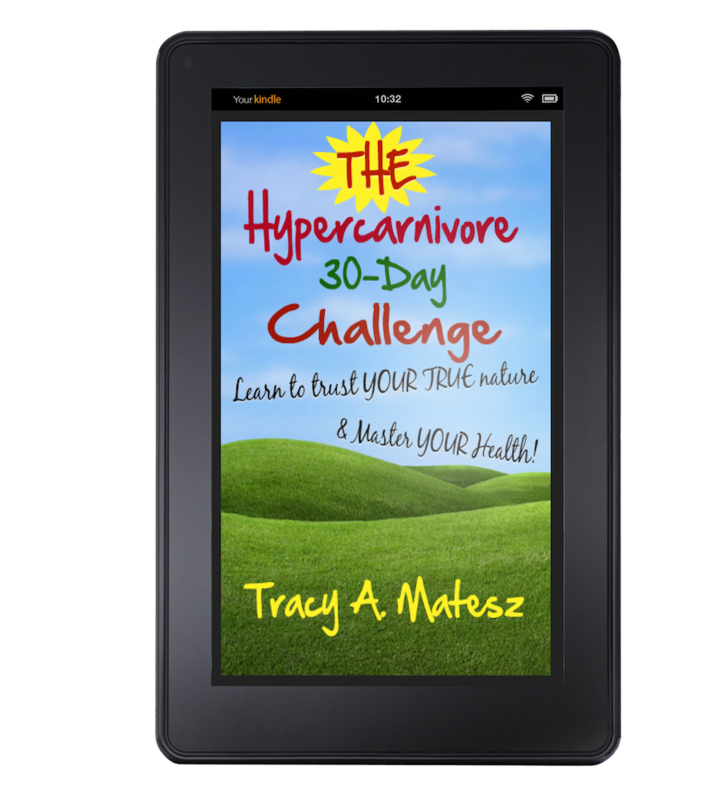 The Hypercarnivore: Eat Meat, Plants Optional, Keep It Simple And BE FREE! Eat Meat, Plants Optional and Keep It SIMPLE!!! We have a Facebook Group ~ Ancestral Eating/Paleo 30-Day Diet Challenge which was named as a result of posting The 30-Day Challenge on LivingYourTrueNature ~ which was named, in part, as a result of having read Your Personal Paleo Code, by Chris Kresser. This was the official commencement back to an animal-based diet that we began one year ago. Our initial transition involved replacing the whole grains and beans in our diet with some animal flesh foods (meats), and continuing with our dark leafy greens, some vegetables, nuts and fruits. Our diet went from 'grains, greens, and beans' to 'meats and sweets' ~ sweets being the fruit, including dried fruits like prunes, some raisins, and dates. When we first began to incorporate animal foods into our diet, we still consumed a fairly large amount of plant foods, still believing they were an essential component to a 'healthy' diet. You can see a sampling of our meals pictured below. 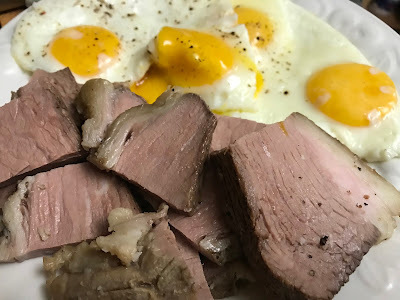 Interestingly, we noticed that when we ate very simply, just some fatty meat, possibly followed by a little half and half in a hot tea, coffee, or our Instant Chicory 'Coffee' we felt our best. In fact, we felt like we were on a high, we felt so good! Georgia Ede, MD, also presented an interesting lecture about the potential hazards of eating vegetables at one of the Ancestral Health symposiums. She has written many great articles about nutrition and (physical and mental) health in her blog, Diagnosis: Diet, Nutrition Science Meets Common Sense. Back to our Ancestral Eating FB group. I have potential members answer a few simple questions, mainly what do you hope to get out of being in this group, and what are your main health goals or issues? Many people respond "to lose weight" and "support" and "to learn more recipes." It's the last part, "learn more recipes" for which this post is dedicated. A disclaimer first. I think I need to change the name of the FB group, as we don't necessarily follow a standard 'Paleo' diet, for which there are endless potential variations of these days. While we did initially feel like we were returning to our Paleo roots, the 'diet' we were eating prior to switching to a plant-based diet, we had to first discern where we went wrong on our previous interpretation of a 'Paleo diet.' After all, we ended up having changes to our health that were alarming enough, we dumped the meat, and opted for grains and beans instead. In retrospect, we now understand our mistakes. Had we only known then what we better understand now, we could have spared ourselves a lot of our precious time and resources, poor health, and a lot of ridicule and scorn among those in both the paleo and vegan camps. Essentially we were still eating a moderately high carbohydrate plant-based diet with animal foods. We still consumed sweet potatoes and winter squash, and plenty of fruit with nuts, coconut cream, and heavy cream. A diet still moderately high in both carbs and protein + fat was not a good formula for us. We are both insulin sensitive. 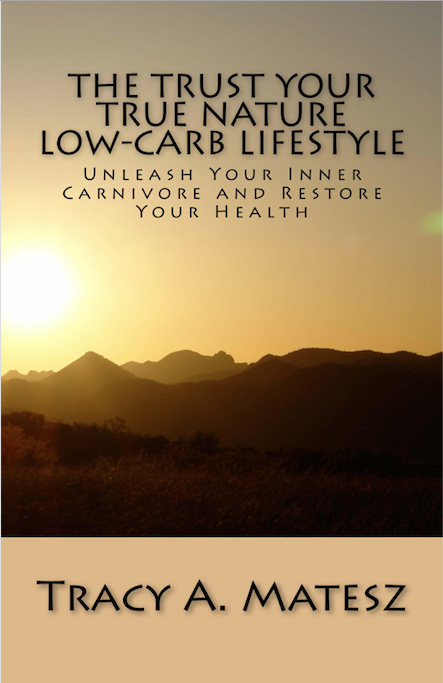 That version of a paleo diet 'appeared healthy' yet it was still driving up insulin, and hence inflammation, and fat storage, including in my breasts which became enlarged, fatty, uneven sized, and excruciatingly tender. 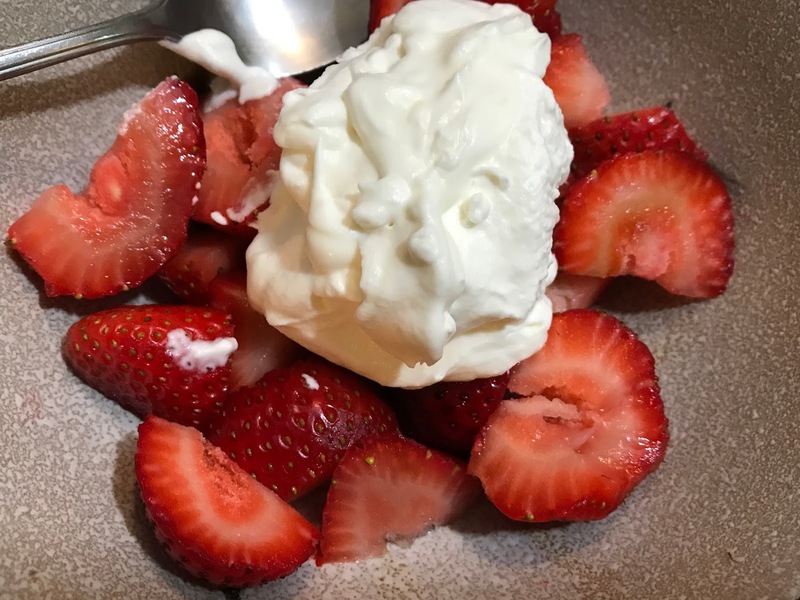 In May, we began to eat a more ketogenic, higher fat diet, which included some 'fat bombs' and other treats. While I know many may find the food pictures with more of the 'colorful' plant foods more appealing, as even sometimes I do, I have come to learn that how my body actually responds versus what I may have been predisposed to believing I 'should' eat are two different things. I think this is true for most of us as we have been hearing to "eat your fruits and vegetables" for decades now. I believe we've been trained to become addicted to these foods, as cravings for them fall away once eating a mostly or entirely animal-based, carnivore or hypercarnivore diet. Don't get me wrong. Just getting the bulk of the population to quit eating processed foods, especially refined grains, sugars, and by and large, most foods that come in a box or can ~ eating some animal foods and fresh fruits and vegetables instead would be a huge improvement. However, there are many people who need to take it a step further, and really minimize carbs, and up the protein and fat. Personally, I can't help but question the need for recipes in order to just get started eating real food? Maybe I've never considered not preparing my own food, more or less from scratch, that I can't relate to having grown up without a culture of preparing home cooked meals. I've never found very many pre-packaged, heat and serve type meals nearly as enjoyable as what I could prepare myself. Have we all become so adapted to eating certain types of foods (born of modern industrialized, lab and factory-produced manufacturers of our myriad food products), that as soon as one embarks upon a new way of eating, they can't fathom not eating those foods? This then drives the swelling market of recipe books and blogs sharing how to make 'healthy' alternatives to their favorite foods, such as a low-carb, gluten-free, vegan, paleo, grain-free, dairy-free, or cauliflower-based alternative to pizza crust, bread, brownies, cookies, power bars, etc., in lieu of the wheat-based, high carb, or processed grain standard options. Are there so few others that consider passing on those foods an alternative? Keeping things basic and simple instead? Just eat meat, and possibly eggs. Steak, chicken, fish, ham, turkey, burgers, etc. are perfectly healthy choices, despite what we've been raised to believe. Seriously, keep it simple. You don't need recipes to start. Add salt and pepper to your taste, and grill. Pan fry if needed. Maybe learn how to make some pulled pork, or slow roasted meats. At least most folks in the 'zero-carb' plant-free, carnivore diet movement are just eating meat, so low-carb pizzas are off the radar, however there always seems to be the outliers that ask if something like pizza is allowed on the (animal only) carnivore diet. Don and I look up recipes for the best methods to prepare different cuts of meats. Most of the time, we use the same few cooking methods, and prepare the same foods over and over. The goal is to nourish ourselves, and feel our best, while enjoying our food. We don't have a need to always have lower carb versions of high-carb, highly processed types of modern foods or desserts! One of the many benefits of trying a carnivore diet, even if only for a month or two, is to help you experience the health benefits and satisfaction from eating such nutrient-dense foods, and being craving-free! We don't have recipes for 'low-carb cauliflower pizza crusts' or 'low-carb, ketogenic-friendly breads' or desserts. Plenty abound on the internet. We JUST EAT MEAT, along with some bone broth, bacon, and eggs. Occasionally we stir-fry a few veggies, or make a quick cucumber salad. We keep it VERY SIMPLE!!! I understand, pizzas and breads are pleasurable, but they are modern foods. Most of the foods sold at grocery stores are processed foods. Convenient foods are processed foods. So-called health bars or protein bars are processed foods. Cookies, cakes, croissants, pizza crusts, etc. are all processed foods. Enjoy indulging on occasion if you like, and if you can tolerate it, but they are not the foods humans evolved to eat. Try seeing if you can get to a place where you do not crave those foods! Imagine the days when you did not have the ability to go to a store, and pick out some sort of frozen dinner to go home and pop into a microwave! Or stop at a local pizza place or fast food joint, and grab food to go. They were not that long ago! Yes, I'm ranting a bit. I don't want anyone to feel like I'm lecturing them as individuals. I understand how we got here. I am simply frustrated by how easily the powers that be have programmed their sheep ~ which at one point or another has been each and everyone of us! We are all unwitting pawns, and yet so few have woken to this truth. We will never be free while we believe naively that we are free. It is pure illusion. If you are overweight, and have limited physical capabilities due to excess fat, or diseased states, you are not free. If you are taking pharmaceuticals, or collecting hand outs, you are not free. I want for you to BE FREE! I want freedom for myself! And I know that it begins in our minds. I respect everyone's right to their free will choices. And I know that there are plenty of people who do not actually value freedom, nor do they want the personal responsibility that really being free requires. However, for those who are interested in improving their health and quality of life, and experiencing a greater degree of physical (and mental) freedom ~ let me make a suggestion. As Amber O'Hearn's blog title suggests, "Eat meat, Not too little. Mostly fat." Instead, we are encouraged to eat more and more plant foods. More servings of fruits and veg. Meatless Mondays. Greatly limit red meat and saturated fat. Do those things really matter? Considering how many people are losing excess fat and recovering from poor health with an entirely meat-based, Carnivore diet, many for which are nearly exclusively eating Ribeye steaks ~ I think not! You can read the many testimonials on Shawn Baker, MD's website, n=many. I cherished my ability to cook up lots of tasty plant foods. Why? Because I knew it was way more of a challenge to make dry whole grains and beans, with lots of greens and vegetables taste good without added fats! People prefer fat, yet we trick our pallets and our minds into believing fats, especially from animal foods sources, is bad for health. If you are wanting to lose weight, or have poor health, especially if you have any type of autoimmune condition, allergies, Rheumatoid Arthritis (RA), digestive issues, skin disorders, or other nagging symptoms, the simpler your diet the better! Sirloin steak, seared on the grill. Chicken thighs browned in our Le Creuset Dutch Oven (I highly recommend investing in one), then simmered with a little bone broth, diced canned Roma tomatoes, and some olives. Chuck Roast can be slow roasted for really tender meat. We also sometimes cut the roast into steaks to grill. Slow Roast Recipe (and more) here. A Bottom Round Roast that was slow roasted, making a nice au jus sauce. You can see how to do it in the video below. Pan-fried steak w/ some Asian greens donated to us from a client. Greens are stir-fried in a wok w/ ghee, salt, and dulse. Your diet does not have to be full of variety. You do not need to eat the 'rainbow' ~ variety of colored fruits and vegetables. Eating sufficient quantities of animal flesh foods and fats, including organs will provide the nourishment your body needs. Pay attention to your direct experience. Trust how your body responds, and listen to what your body craves, not what your mind thinks it needs. You don't have to create any fancy dishes. You can eat the same eggs, bacon, burgers, steak and/or fish, chicken or turkey that you like everyday if you are enjoying it, and you are not experiencing adverse reactions after eating those foods. If you like eggs, but have an adverse reaction, you may need to limit eggs for a while until you recover better digestive health. Then you can try eating small amounts again to see how you respond. Roast, grill, pan-fry, steam, or bake your meats and/or fish and seafood. Eat only what you crave of greens and vegetables. Do not feel obligated to eat those foods! Cook dark leafy greens and vegetables in fat, such as ghee, bacon fat, or beef tallow. The beneficial nutrients will be more easily absorbed with the fat, especially animal fats. Just eat meat and fat, and fill in the rest with what is appealing to you of fruits and vegetables. Eat minimal to no plant foods for at least one month to see how you feel, especially once you incorporate them back into your diet after an absence. Think of it as an elimination diet, only it can be your daily fare for as long as you feel good. and satisfied for hours, without any cravings! Country Ribs ~ see below. One package had 4 fairly big boneless shoulder chops. Pretty impressive. Just the right amount of fat around the edge, but tender and meaty throughout. wok-fried Asian greens, cooked in ghee w/ a little pecan oil, salt, and dulce. 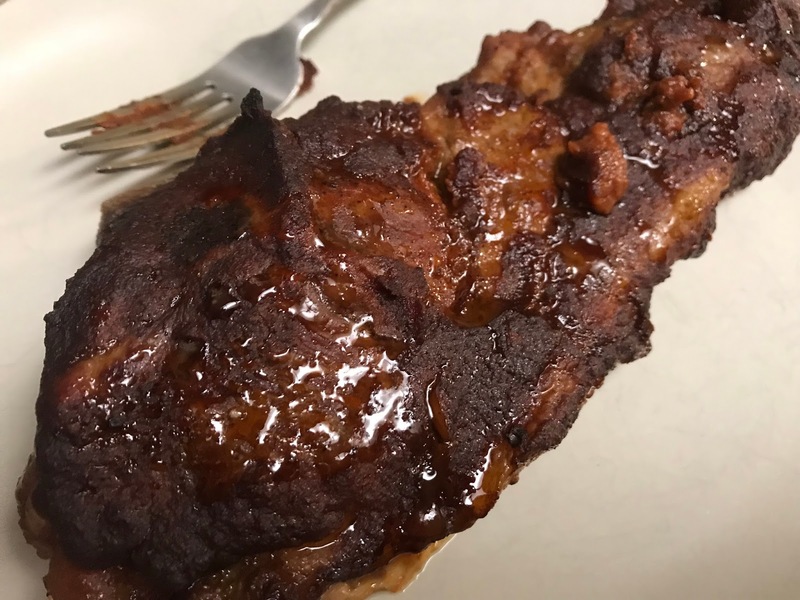 slow roasted, and basted with a modified version of the homemade low-sugar/low-carb barbecue sauce, found in Neanderthin, and reprinted in my book, The Trust Your True Nature Low-Carb Lifestyle ~ available on Kindle, or as a Free E-Book download. Slow Roasted Beef Ribs, recipe on LivingYourTrueNature blog. Below is a video of our recent Hypercarnivore Shopping Haul.